I love peaches! And living in Georgia in the summertime means lots of great local fresh peaches, which in turn means lots of peach cobbler! Delicious! Some people like to debate whether a cobbler with a pie style crust is truly a cobbler, or if only cobblers made with a biscuit like topping is deserving of the "cobbler" moniker. I am a southern girl, born and bred, and I will tell you both crust and biscuit style cobblers are indeed worthy of being called cobblers. The only cobbler I think should be called something else is the one Paula Deen serves in her restaurant. I think it's more like a peach bread pudding. I am not a fan of mushy cobblers. 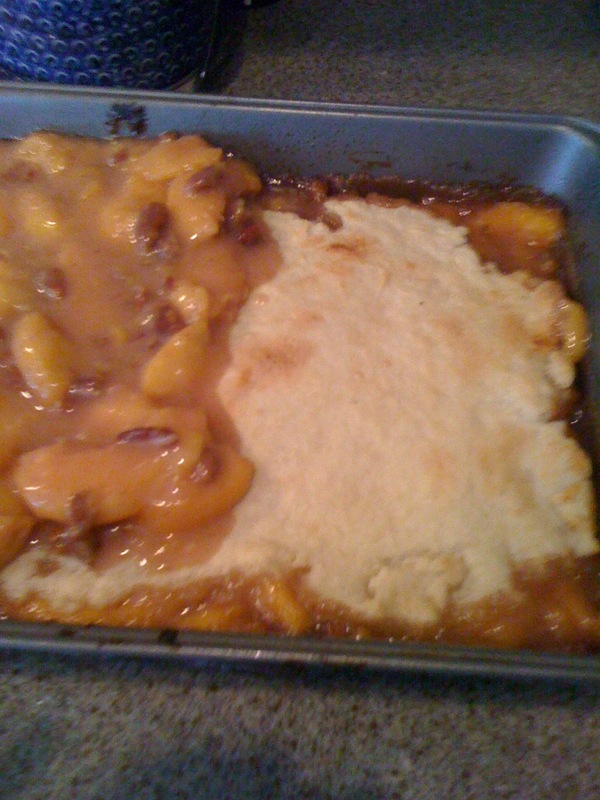 For a while now I've attempted to make a good peach-ginger cobbler because I love the combined flavors of gingers and peaches. I finally found a balance I like and so I decided to post the final recipe. I also decided I wanted a little more "crunch" and texture in the cobbler so I added toasted pecans ( and besides, I still had half a bag of pecan pieces left over from the cookies I made a few days ago, which I wanted to be sure did not go to waste.) I think it was a really good addition. 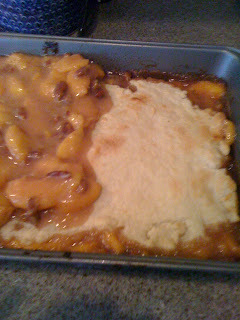 I will warn you: making a cobbler with a homemade crust is time consuming, but so very worth it. So make this cobbler on a day you can and will enjoy spending a few hours in the kitchen. As for the crust, I prefer a butter crust because I think it has better flavor and flakiness than a shortening based crust. The pie crust I use, and love, is one I picked up from Smitten Kitchen, so click on the link and go to her tutorial and recipe on pie crusts. It's a great read! And then get ready to make your cobbler! First, make your dough. It will need to chill for at least an hour before you roll it so you have to plan ahead. You can also make it the night before. Just make sure you wrap it in plastic wrap to chill so it doesn't pick up odors and flavors from the fridge. I don't have photos of this part, but like I said, go to Smitten Kitchen and she will show you the ropes if you don't normally make your own crust. So, in a large bowl whisk or use your pastry cutter to combine flour, sugar and salt. Slice the butter into 1 inch cubes and cut it into your flour mixture with a pastry cutter. If you don't have a pastry cutter, just use 2 forks. Keep working this mixture, cutting in the butter, until the dough starts to look "chunky"- the butter will still be in small pieces. Thats fine. Now, drizzle about 1/4 cup of water onto the dough and mix with a rubber spatula. Keep adding water, 1 to 2 tablespoons at a time until the dough starts to form into large chunks when stirred. Bring the dough together in a ball and knead. If it falls all apart and wont stick, that means you need more water, add more a very little bit at a time. The crust will still be somewhat dry when you make it, but it will clump together once it has enough water. Once you get it to the right consistency, roll it into a ball, wrap in plastic wrap and stick it in the fridge. Now, you are ready to start on the cobbler. Yummy. 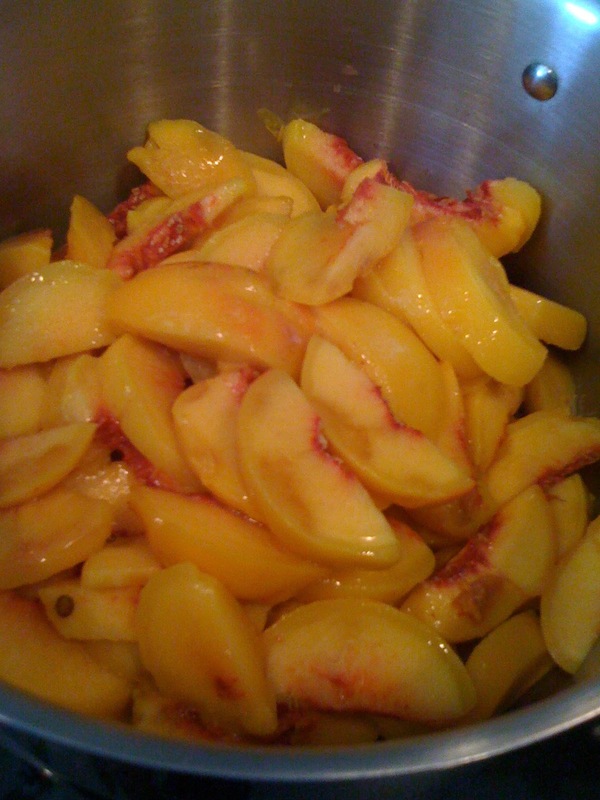 So, peel and slice up 6 cups of ripe peaches and place in a dutch oven. 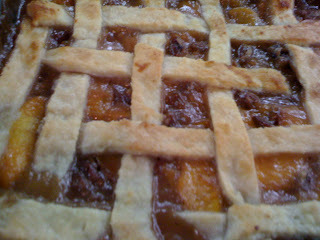 For me, this took about 9 or 10 peaches, and I may have even stolen a few slices to eat for myself. Then add the sugar, flour, nutmeg, and ginger and stir it all together. Allow it to sit until a syrup forms (see photo below); this will only take 10 minutes or so. Put dutch oven on a burner at about medium high heat and bring mixture to a boil. Turn heat to low and cook until peaches are tender. Add butter and vanilla, stir until butter is melted. 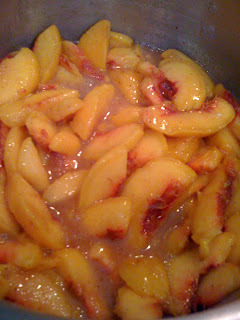 Add the rest of your peach mixture to the pan. Roll out the rest of your dough and cut into 1 inch strips and the top your cobbler with crust, applying it in a lattice pattern. Bake another 15 minutes, or until golden brown. And you are done! Now, serve to your family while still warm. Delicious! 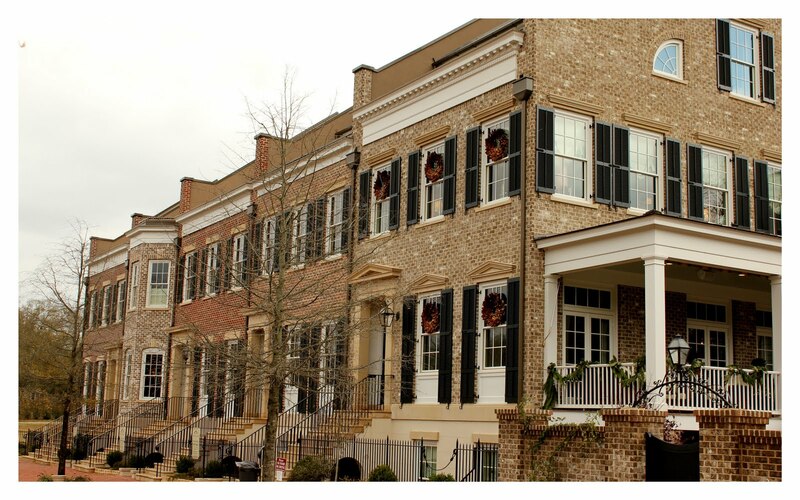 Have y'all seen the Southern Living Idea House? If not, stop by Puttin' on the Grits and check out her photo tour. Lovely! Puttin' on the G.R.I.T.S. 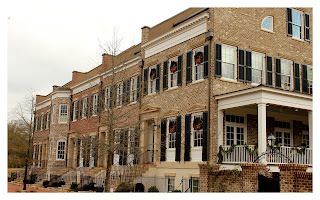 : Southern Living Idea House: "I realized that I never shared with y'all when we went up to see the Southern Living Idea House in Senoia, Georgia. I know I shared picture..."
Banana Nut Bread- Quick and easy! We love banana bread here at the Sassy Pants house! My favorite recipe is quick and easy, and takes only a few ingredients. I make mini loaves so we can eat a fresh loaf the first day and freeze any others we want for later consumption. Not to mention, mini loaves are just cuter! 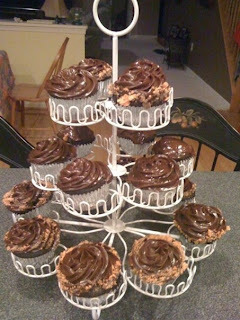 Also good to add, if you like: 1/4 cup chocolate or butterscotch chips. YUM! Combine the first 4 ingredients in one bowl. Usually there are small little bits of butter even after you mix it all together ( I use a spatula or whisk)- thats fine, don't try to get rid of them. Then combine the rest of the dry ingredients in another bowl. Mix dry and wet ingredients together and stir until combined. Add optional ingredients now. Makes 2-3 mini loaves or 1 large loaf. Mini loaves: bake for 30 minutes. Regular loaf- bake about 50-55 minutes. Cool for about 10-15 minutes on a wire rack while still in pan, then remove. Once cooled completely, you can wrap in foil and place in a freezer bag to be eaten on a later day. But honestly, unless I make a few batches, ours never makes it to the freezer! 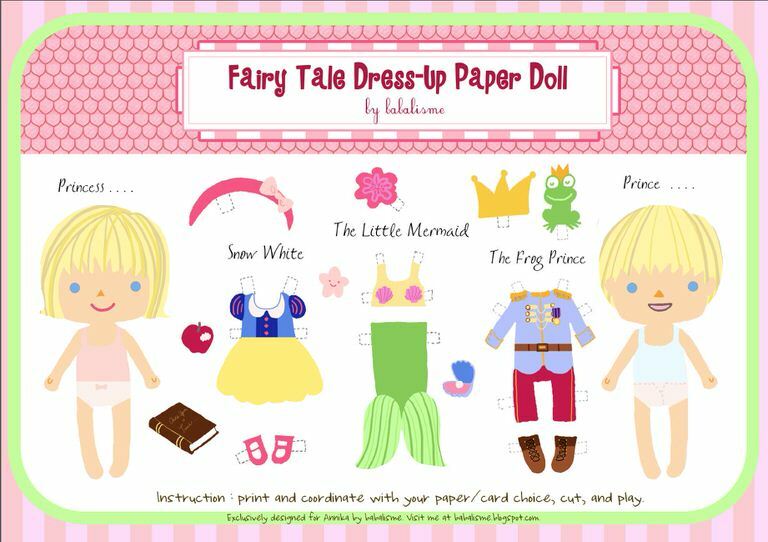 Check out the link below to Tatertots and Jello- it is full of printable ideas for kids, LOADS of fun games, paper dolls, books, and more!! The pictures below are all ideas featured on the blog and there are SO many more! Get busy and have fun!! Right now my sewing machine is in a closet and my sewing table is under a pile of crap. Im hoping we can remedy that tonight and I can start working on a new quilt and some scrap booking projects I have piling up in the craft room. Wish me luck and wish Mr SassyPants some energy. The poor man is being worked mercilessly at home lately with all the projects we have going on here on top of the normal work he does and all the regular prjects life throws at us (lawns, cars, maintenance, kids, etc). I keep waiting for him to fall over exhausted at any moment! Here are a few fabrics and kits I am loving right now With so many great options, it is really really hard to choose. First option is the Flurry Quilt Kit at Fat Quarter Shop The fabric is by Kate Spain for Moda fabrics and it is just perfect. This is a Christmas quilt and would be perfect for a gift or to keep for myself (you know if I was feeling selfish, which I often do ). And I love that it comes as a kit so it makes life so much easier! And what about this fat quarter bundle, also from Fat Quarter Shop (I love their site- so many great kits and fabrics!). I could see this as a quilt or as a bag or as a table runner. And last but not least is this adorable octopus by Melanie Huriston of Melly and Me which was featured at the Moda Bake Shop. I would love to make some of these for Lily's room. Anyone else have any great links, projects or fabrics to share? Becasue, you know, I need more choices! Over a year to be exact. Im not sure how it happened that I stopped blogging for so long, but I guess life (read:work) just got in the way. We moved to Georgia at the end of June 2010. 6 weeks after arriving here I started working full time and had a long commute every day- there was just no free time to be used for blogging. I've really missed blogging, and I've missed quilting, sewing and making my sweet treats and all the other things I had time to do before working full time, but the extra money from working was nice. Life kept us busy, we moved our son into a private school near my office, and everything was very hectic, but was a sort of organized chaos. A few months ago we found out we are expecting our second child in October. We are so excited and overwhelmed too! But, life kept moving, and then baseball season started. My office and my sons school are over 30 miles from our home, so our days were already long, but add baseball games that didn't end until after 830 to the mix, and I was gone from the house many days for over 12 hours. It was hard to juggle pregnancy, work, baseball and a 9 year old, but I felt I was managing it all pretty well. But my body was starting to revolt. At our 18 week appointment we had an ultrasound and found out we were having a little girl. We also found out I have a complete placenta previa. Although we knew there was a chance it could move, we were still very concerned. Two days later, I started bleeding (spotting really) at work, and had to go to the doctors office and then the ER. The event was labeled as a threatened miscarriage and the doctor gave me a stern lecture about my busy lifestyle and informed me that I would be put on bed rest and possibly hospitalized if another episode like this one occurred. She also gave me a lot of other restrictions: pelvic rest, no lifting anything heavier than my purse (obviously she has never seen the amount of crap in my purse), and only light housework. At that time Mr SassyPants and I decided that I needed to stay home where I could relax and lie down as necessary. The next week I gave my notice at work. So now I am at home and able to relax when need be, take it easy and concentrate on growing a healthy full term baby. We have our next u/s in a few weeks and we are hoping to see that the previa has resolved itself; we are just taking life day by day. And poor Mr SassyPants is still a Navy Diver, but is now also maid, gardener and basically he is the one that does about 75% of everything around here. He is looking a little tired, but swears he is fine. And we have started trying to choose strollers and car seats (there are FAR more choices than there were 9 years ago). And bascially we are just trying to take life one day at a time. Now that I am home again I expect to be abel to start baking and sewing again and I am so excited about that. I also look forward to getting back to blogging again. I have really missed it! Remember how I mentioned earlier that my life is just a big bowl of crazy lately? Well, I thought I would list my project to do list so you have an idea of what it is I am working on, and what you can look forward to seeing featured on my blog in the near future! This is not the actual swing. The actual swing is in pieces. 1. The swing. My parents have a pretty sad looking swing in their basement. They were actually going to take it to the dump. I decided it would be a great thing for us to put on the bank of the big pond in our backyard. 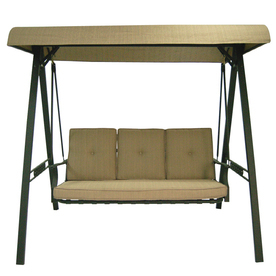 So, I am making new lower and upper seat cushions, throw pillows and a new canopy for it, as well as repainting it. It is a big project. I am almost finished with the canopy. Woohoo! This is the actual chair. It is in my sons room so that explains the dirty floor. If you have a little boy, you understand. 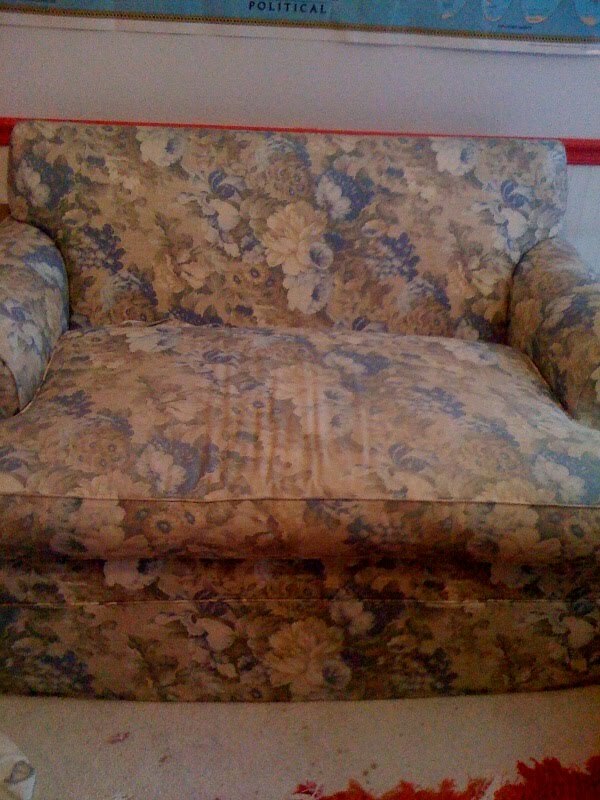 Or if I am just gong to reupholster it. We'll have to see what i decide. I'm sure you will be anxious to find out my decision. lol. No matter what method I decide to use, this is the fabric I have chosen. Its cheap, durable and neutral ,and don't forget, Cheap!! Our kitchen is nautical themed and I plan to make some nice throw pillows and a quilt to add some color to the chair. The dresser. Notice a piece of the swing in a pile in the background. 3. The dresser. This was in my sons room here at my parents but we moved it out when we redecorated his room here. So, now I have decided it would be perfect for his room in Georgia. I am painting in black with a nice coat of gloss. It will be perfect for my sons room. I am also changing out the hardware, or painting it silver. Your guess is as good as mine. Those are the big things I need to get done. I also need to make a quilted fabric cover for my moms washer and dryer, and make a table runner, and paint a rolling cart to use as a bar on our screened in porch, and paint a Washington Nationals scoreboard on my sons wall. Ugh. My head is spinning. This list takes second priority. Packing, the usual laundry cycle, little league, Washington Nationals games and my new running program (explained below) take priority. I am also starting a running program because I signed my husband and I up for a 5K in August so I better be able to do something besides pant, whine and sweat when we get to that date. I turn 36 in a few days and I am fat, out of shape and feel far older than my 36 years. I am d.o.n.e being unhealthy and out of shape. Remind me of this every now and then, ok? There will be a whole other post on the issue of health and weight loss soon. I am trying to get ready for a trip this weekend. Which means loads and loads of laundry, getting the car to the shop for oil change, and still trying to pack for the move and finish all the projects I have scheduled to complete before my move. Basically, Im running around like a chicken with no head. I have managed to get a few projects completed. 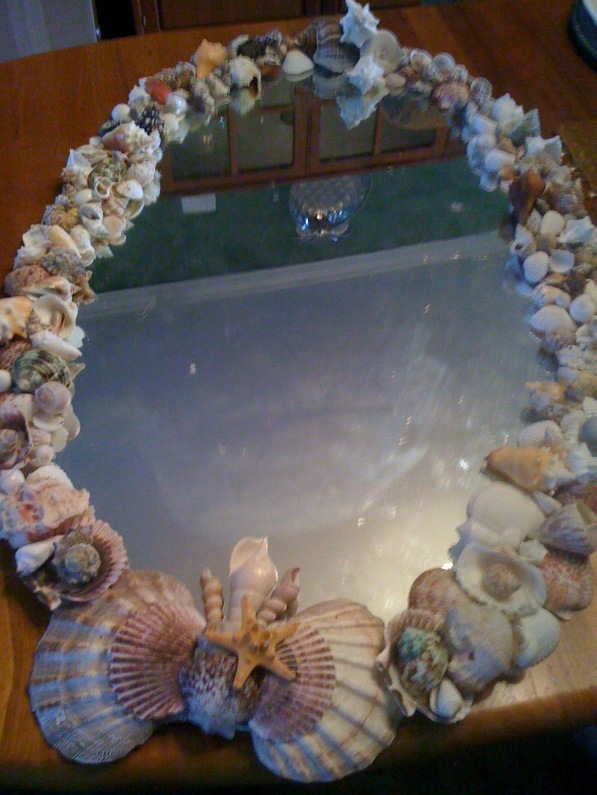 My favorite one being the shell mirror I was working on last week. My parents renovated their downstairs bathroom, and they decided to replace the plain oval mirror over the vanity so I scooped that mirror up and decided it needed a facelift. I thought surrounding it with a frame of shells would bring new life to it, and it would be perfect in our kitchen in Georgia. I am happy with the final product. I would like to make one with small all white shells or all white starfish. Maybe for the porch? First, adhesive. I used Beacon 527 glue. This glue worked wonderfully, dries clear and can be removed with acetone. The only drawback? It smells nail polish remover. The smell is very strong. I recommend using it in a large or well ventilated room. This is not the ACTUAL mirror, but it identical. I forgot to take a picture of the plain mirror before I started, so we have to make do with a stand in! Its just a very basic oval bathroom mirror. Now, here is the finished product. The photo is terrible, I know, but it is the best I can do with everything else I have going on right now! When I get it hung up in Georgia (end of next month) I will take a picture of it on the wall so you can get a better idea of just how great it looks! Now, if you will excuse me, I need to go finish the laundry, do the dishes, and clean the house and hopefully find time to remove my half destroyed nail polish. I live a glamorous life, I know. I am preparing for my move to Georgia, which is in 45 days! 45 days? ACK! I am nowhere near ready. You would think after spending my entire life as a military dependent that I would have this moving thing down pat. But honestly, the only thing I've mastered is moving time procrastination. I need boxes, I need space bags for my clothes, I need to finish all the projects I've promised myself I'd do before the move- like recovering a love seat and ottoman, refurbishing a large 3 person swing and creating all new cushions and canopy for said swing, making a shell framed mirror, a tassel for a friends daughter... The list goes on and on but I'll stop now because all this is giving me a stomach ache. So, today I am working on the canopy for the swing. I finished creating the pattern and cutting all the pieces last night. Now the sewing begins. And hopefully, i can squeeze in some laundry and a shower in there at some point, because I really really need a clean body and clean clothes. Im starting to resemble a wild animal. So, wish me luck. And if you see a woman drowning in a sea of fabric and stuff that should be in boxes already? Don't worry, its just me, and life as an Army daughter and Navy wife have fully prepared me to handle just such an occasion.